Place a custom-fit Garage Mat under each vehicle in your garage, and you'll never walk through grease, sand, salt, or slush again. The Garage Mat catches every drop of mud, slush and grime that falls off of your vehicle allowing your garage floor to remain clean and dry. You'll never track mud and grime into your home again. Slips and falls can be prevented by containing the wet, slippery stuff that travels into your garage on the wheels, wheel wells, and undercarriage of your vehicle. Made of thick, rugged 20-mil vinyl with a 1" raised Snap-On Edge. The specially engineered Snap-On edges are extremely durable, as well as fast and easy to install, without tools. All sizes of the Park Smart Clean Park come complete with 24" long Snap-On side pieces and 18" long Snap-On end pieces. And it's easy to clean. 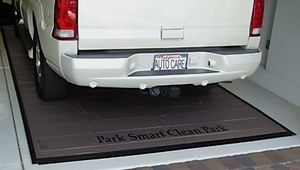 After removing one or more of the lip end pieces closest to the garage door, sweep or hose off the Clean Park Mat. For mats with heavy debris accumulations use either a Wet/Dry Shop Vac, or simply squeegee out the garage door. Oils and grease wipe right off the mat's waterproof, non-flammable, oil-impervious vinyl surface. So your concrete floor remains clean and free of grit, salt damage and oil stains. There is a one year limited manufacturer's warranty on this durable mat. Note: Assembly required - No tools needed. 1" side snap-on edging needs to be attached after mat is in place. Assembly directions are included. Please select a size that will achieve at least a 6-12 inch border around your car.